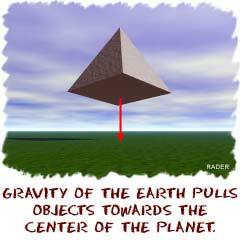 Gravity or gravitational forces are forces of attraction. We're not talking about finding someone really cute and adorable. It's like the Earth pulling on you and keeping you on the ground. That pull is gravity at work. Every object in the universe that has mass exerts a gravitational pull, or force, on every other mass. The size of the pull depends on the masses of the objects. You exert a gravitational force on the people around you, but that force isn't very strong, since people aren't very massive. When you look at really large masses, like the Earth and Moon, the gravitational pull becomes very impressive. The gravitational force between the Earth and the molecules of gas in the atmosphere is strong enough to hold the atmosphere close to our surface. Smaller planets, that have less mass, may not be able to hold an atmosphere. Obviously, gravity is very important on Earth. The Sun's gravitational pull keeps our planet orbiting the Sun. The motion of the Moon is affected by the gravity of the Sun AND the Earth. The Moon's gravity pulls on the Earth and makes the tides rise and fall every day. As the Moon passes over the ocean, there is a swell in the sea level. As the Earth rotates, the Moon passes over new parts of the Earth, causing the swell to move also. The tides are independent of the phase of the moon. The moon has the same amount of pull whether there is a full or new moon. It would still be in the same basic place. We have to bring up an important idea now. The Earth always produces the same acceleration on every object. If you drop an acorn or a piano, they will gain velocity at the same rate. Although the gravitational force the Earth exerts on the objects is different, their masses are just as different, so the effect we observe (acceleration) is the same for each. The Earth's gravitational force accelerates objects when they fall. It constantly pulls, and the objects constantly speed up. People always say, "What about feathers? They fall so slowly." Obviously, there is air all around us. When a feather falls, it falls slowly because the air is in its way. There is a lot of air resistance and that resistance makes the feather move slower. The forces at work are the same. If you dropped a feather in a container with no air (a vacuum), it would drop as fast as a baseball. But what keeps the Moon from falling down, if all of this gravity is so strong? Well, the answer is that the moon IS falling; all the time, but doesn't get any closer to us! Remember that if there wasn't a force acting, the Moon would be traveling in a straight line. Because there IS a force of attraction toward the Earth, the moon "falls" from a straight line into a curve (orbit) around the Earth and ends up revolving around us. The Earth's gravity holds it in orbit, so it can't just go off in a straight line. Think about holding a ball on a string and spinning it in a circle. If you were to cut that string (no more gravity), the ball would fly off in a straight line in the direction it was going when you cut the string. That direction, by the way, is not directly away from your hand, but tangent to the circle. Tangent is a geometry term used to describe a direction that are related to the slope of a curve. Math stuff. The pull of the string inward (toward your hand) is like the Earth's gravitational pull (inward toward the center of the Earth).